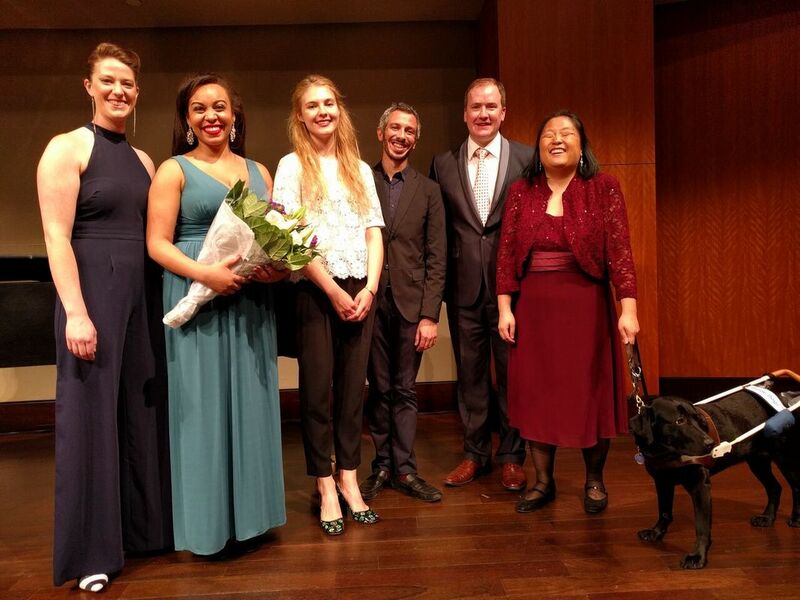 Ms. Christine Lyons (Soprano) is a 2018 Grand Prize Winner in the Mary Trueman Art Song Vocal Competition. ​Second photo is with Blair Boone-Migura, Founder, President, Executive Director, Art Song Preservation Society of New York. Praised as “especially moving” by the Pittsburgh Post-Gazette and as a “sparkling soprano” by the Broad Street Review, Christine Lyons is a dynamic artist on the rise. This 2017-18 season, Ms. Lyons will be presented in concert by Vocal Arts DC at the Kennedy Center, by Denyce Graves at Wolf Trap, and by Sherrill Milnes at Opera Naples. She will also sing the roles of Giulietta in I Capuleti e i Montecchi with Saltworks Opera, Adina in L’Elisir d’amore with ARE Opera, Micaëla in Carmen with Opera Ithaca, and in summer joins the inaugural season of Teatro Nuovo to sing Amenaide in Tancredi rifatto. The Art Song Preservation Society is the sponsor of The Mary Trueman Art Song Vocal Competition held bi-annually. This competition honors Mary Trueman, a renowned teacher of French and German Vocal Literature and Diction at Rice University and of Voice at Texas Southern University. With her combined background and knowledge of French & German language and literature, piano accompanying, and vocal pedagogy, she was a supreme teacher of art song literature. In 2012, the final eight competitors were selected from over 100 auditionees, and sang exquisite selections from the vast art song repertoire. In 2014, 14 finalists were selected from over 150 applicants. In 2016, 10 finalists were chosen from over 150 applicants. The search began in 2017, to find qualified finalists to compete in the next round of this exciting voice competition. Step 2 – Semi Final Auditions, Sept 30th (10am-7pm) & Oct 1st (10am - 7pm) in NYC – singer begins with his/her choice and the judges will make a decision as to whether or not they will hear a 2nd or 3rd piece. Judging the finals competition in the past are some of the Art Song Preservation Society’s esteemed Advisory Board Members and friends: Corradina Caporello (The Juilliard School), Thomas Grubb (author of Singing In French: A Manual of French Diction & French Vocal Repertoire), Thomas Muraco (The Manhattan School of Music), Benita Valente (Temple University), Marni Nixon * (1930-2016), Mark Markham (collaborative partner to American soprano, Jessye Norman) and Blair Boone-Migura (ASPS Founder & Director). Joining our illustrious panel in 2017 are Maya Hoover (mezzo-soprano, and author of A Guide to the Latin American Art Song Repertoire) and José Meléndez (Academy of Vocal Arts). The winner receives a grand prize of $1,000, insightful coachings and rehearsals with members of the Art Song Preservation Society’s Advisory Board, career advisement, consideration to be cast in a prominent role in a future production with the Hawaii Opera Theater in Honolulu, and a solo song recital in New York City sponsored by the Art Song Preservation Society. In the past, Encouragement Awards and awards in French mélodie singing, German Lied singing, collaborative piano performance, and audience favorite have also been awarded with a cash prize. View Part One and Two of the 2016 Mary Trueman Art Song Vocal Competition below!